The project ELISA (e-learning for improving access to Information Society for SMEs in the SEE Area) is an INTERREG IIIB CADSES funded project that aims at improving the access to knowledge and the information society of SMEs in South-East Europe, through close cooperation of academic and business communities at a transnational level. This scope will be achieved by transferring EU best practice training know-how and by developing national training strategies. In the following page you will find the workpackage timeplan. 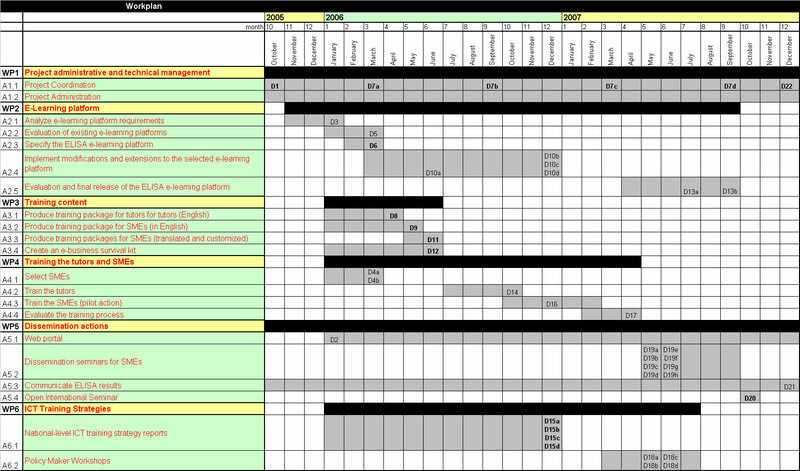 In the following page you will find the project's work breakdown structure. In the following page you will find the deliverables list. In the following page you can find the project management tools.